Ok, so when our reviewer talked about Non-Stop yesterday, her focus was, let's just say, somewhat Neeson-centric. 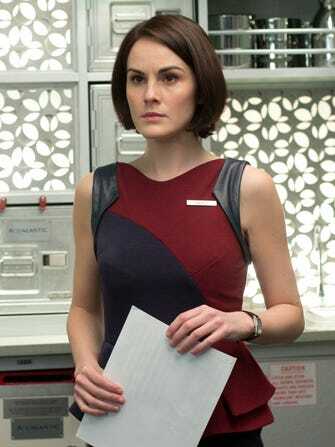 But, there was another performer of note in the bomb-on-a-plane thriller — Downtown Abbey's Michelle Dockery. Starring in her first action film, your favorite hard-edged, Jazz-Age widow handled constant threats, and sharing the screen with vets Liam Neeson and Julianne Moore, like she was born for the genre. Here, we talk to the delightful and laid-back actor about taking on a new sort of professional challenge, wearing only one costume the whole film, hanging with Lupita Nyong'o, and, yes, what's up next for Lady Mary. How was working on this action thriller different from, say, the drawing-room drama of Downton Abbey? Yeah, and a lot of the shots you’re in — well, actually, most of them — feature a hundred extras sitting there in airline seats. In reference to your day job, you’re at Highclere Castle most of the time. Here, you were likely on a set that’s moving in parts. Was this your first real experience with a completely constructed set? “It wasn’t something I was looking for. It’s not like I set out looking for an action thriller. It was more the script that drew me to it. I wanted the opportunity to work with Liam and Julianne. It was a bonus, really, that the set and genre [were] different." Bonus? How so? What’s your next challenge, then? “I’m not sure! I don’t really set out to do something different. I just wait and see what happens. For me, it’s all about the writing. I want a script I can’t put down. That’s what’s so exciting about being an actor; You don’t know what’s around the corner. I enjoy that part of it." 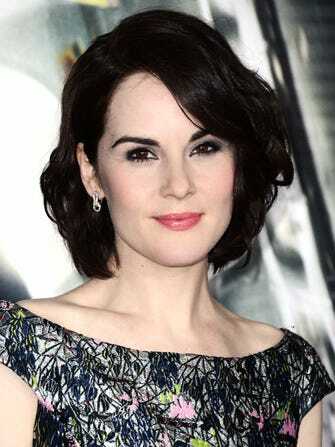 Click ahead for more with Michelle Dockery. Now, after years of Downton where you’re basically doing a costume change for every scene, was it enjoyable to have just one airline-attendant uniform? You shot this primarily in New York. Was that fun for you? You're shooting season five of Downtown right now. We know you're sworn to secrecy about the plot, but can you even give us a hint about what Lady Mary is up to next season? Non-Stop is in theaters this Friday, February 28.